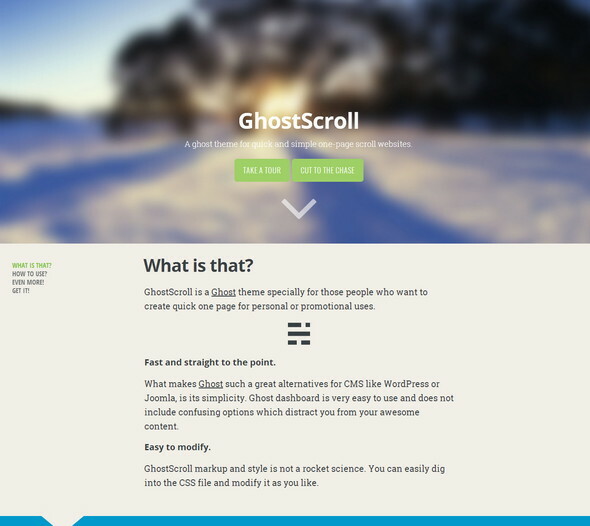 Ghost CMS may not be as popular as the WordPress blogging platform i love the simplicity of ghost blogs. Ghost will not work on cpanel or vps servers just with lamp stack. Node.js is required on the server and ghost to be installed on top of it. It took a while to figure out the installation itself but at the end of the day i was amazed by the simplicity of the ghost cms. 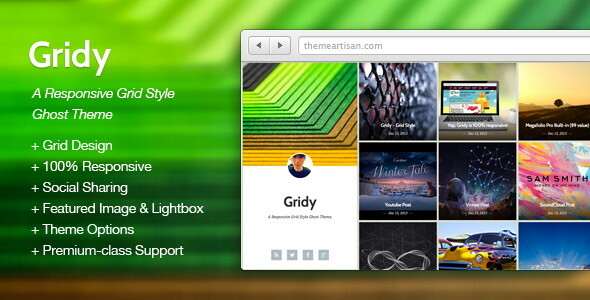 Ghost means strict blogging just like tumblr network and nothing else as far as it is concerned to me. 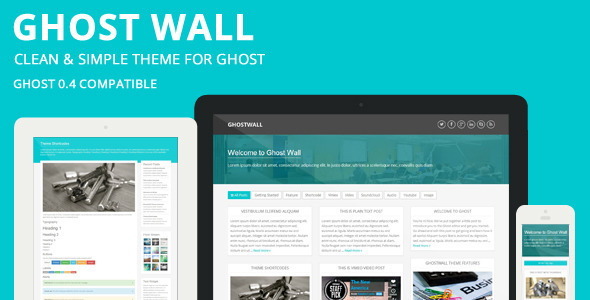 Today we will take a look at some best ghost themes that are available in the internet so you decide which one to use. Oh and its ridiculously fast. 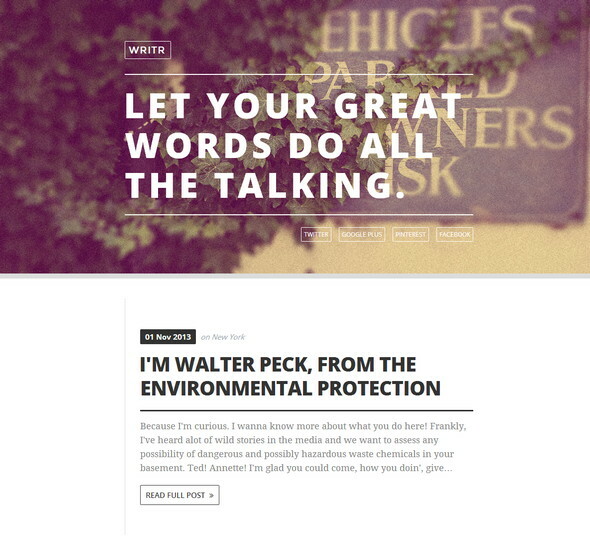 Typography seems to be the perfect on ghost themes and most themes weigh for their stylish clear typography fonts. Minimalism along with clean typography take ghost themes to a new level. At first glance i found ghost cms and its themes much more targeting towards to the copywriters or say journalists who write like hell. Latest modern website features like Parallax effects, flat design, responsive layout options are well integrated into ghost themes here. 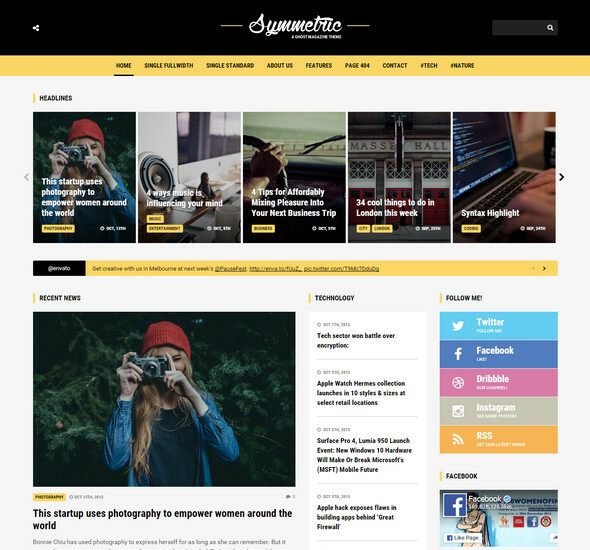 Also check our free WordPress responsive themes 2018 we have compiled with latest themes. 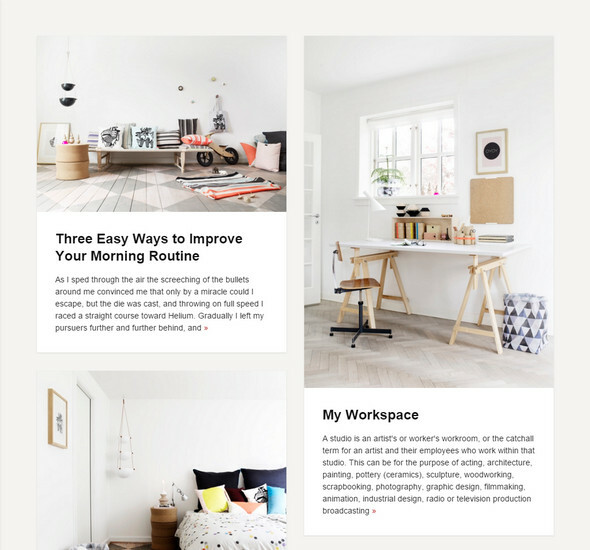 A free minimal looking theme made for bloggers who want their articles to be bold and impressive in typography. 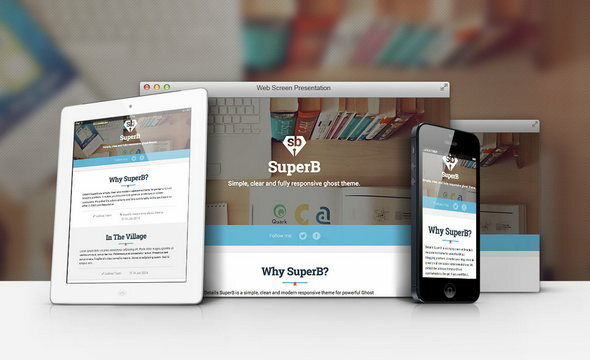 The theme is responsive enough for all devices orientation with its fluid layout. 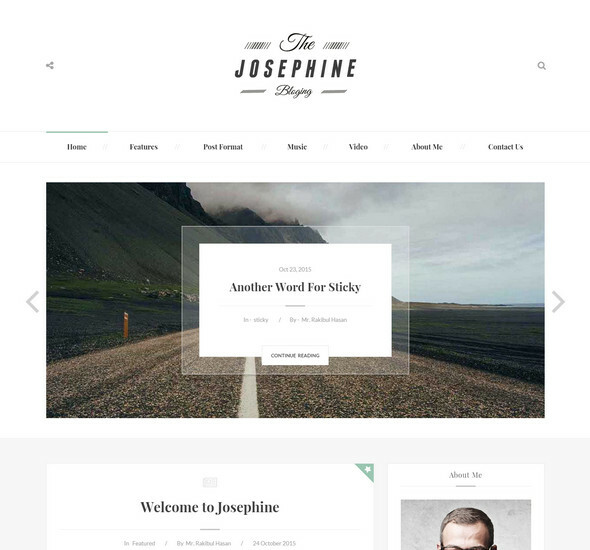 A single page theme made for ghost cms with minimal design and with smooth scrolling, this theme is a must try for those who like to showcase a product. This theme is the only free ghost theme i found intriguing others are just like tumblog themes. Also let me know if you have found any free theme. I will include it here if it is good. 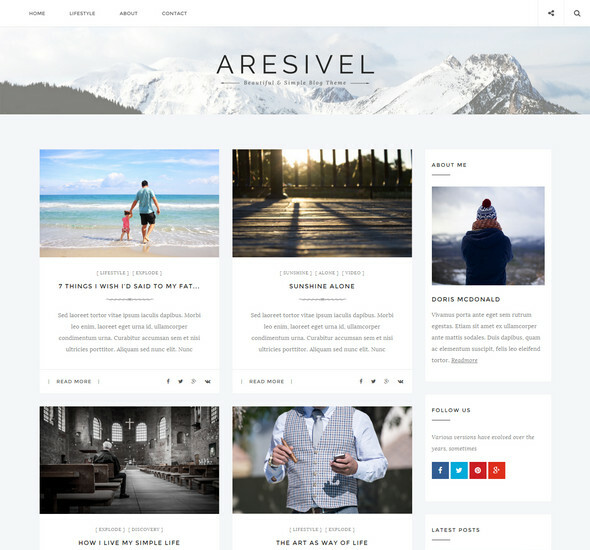 Another free theme which is awesome to use on your new website. Take a look at the demo. 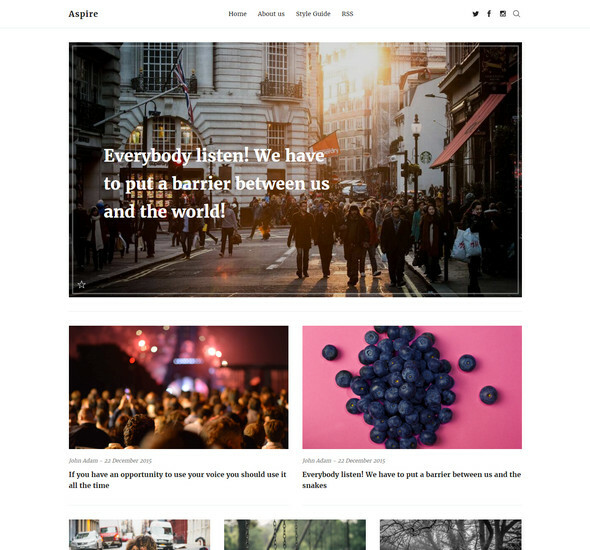 Paperleaf is a very minimal theme for Ghost CMS with brilliantly laid out contents and this theme is responsive, feature rich matching the needs of a designer portfolio, food recipe collection, general blogging articles etc. 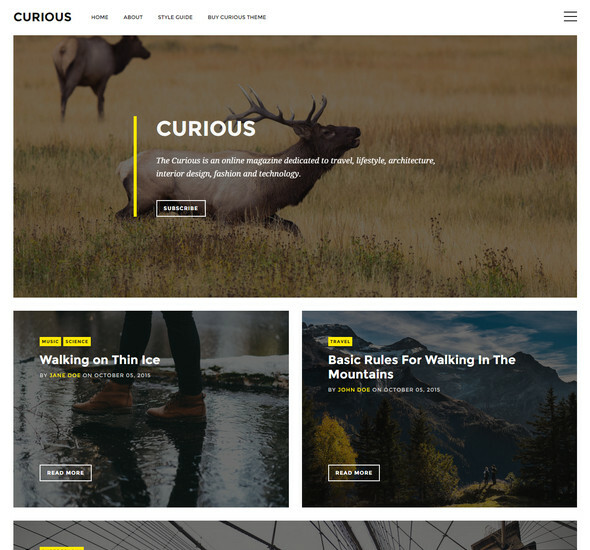 Standout in the crowd with this uniquely content focused theme to display a lifestyle, travel, personal style website. 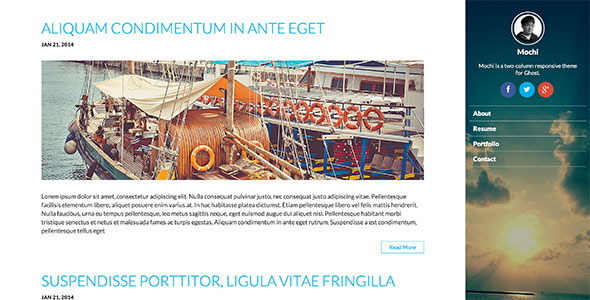 The theme supports responsive design, multiple widgets, post formats for making your content suitable for each post types. 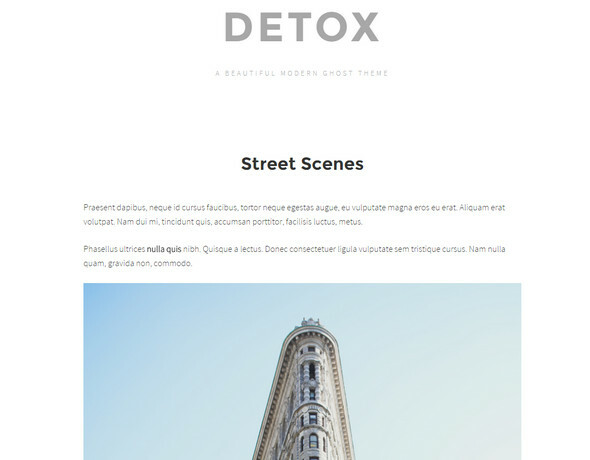 With sleek effects on your articles and a large call to action frontpage section will leave you open for crafting a unique looking blog in a matter of minutes. 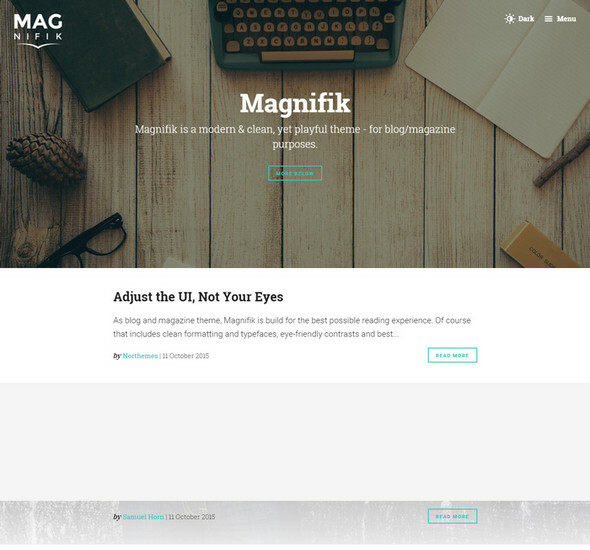 Combine the power of Ghost cms and Magnifik theme to get lots of options to built a magazine/blog theme which is feature rich and as well deliver eye candy contents. 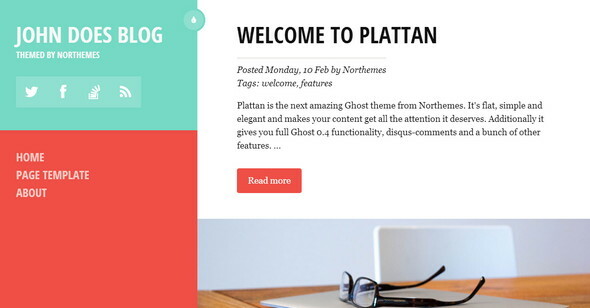 Plattan – the next responsive Ghost theme from Northemes. 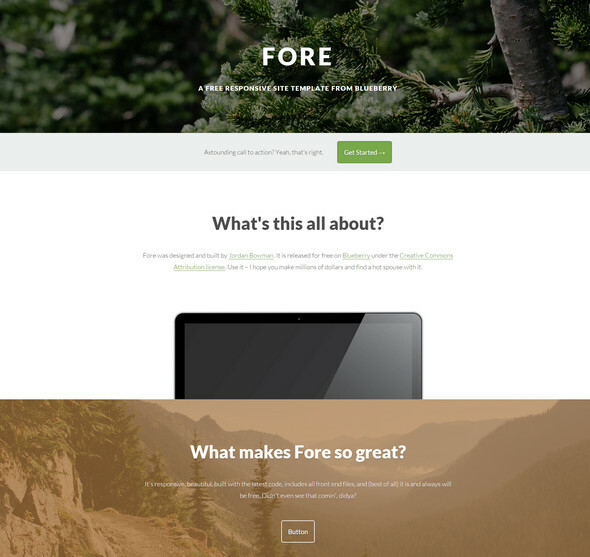 It’s flat, simple and elegant and makes your content get all the attention it deserves. 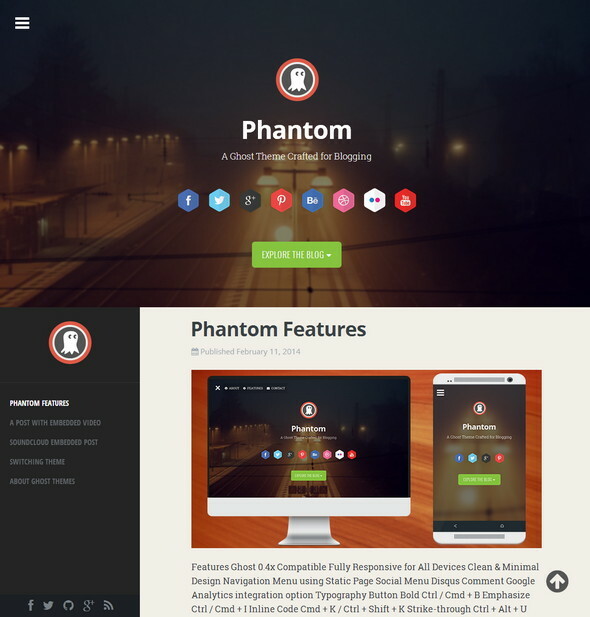 Phantom is a responsive Ghost theme for blogging. 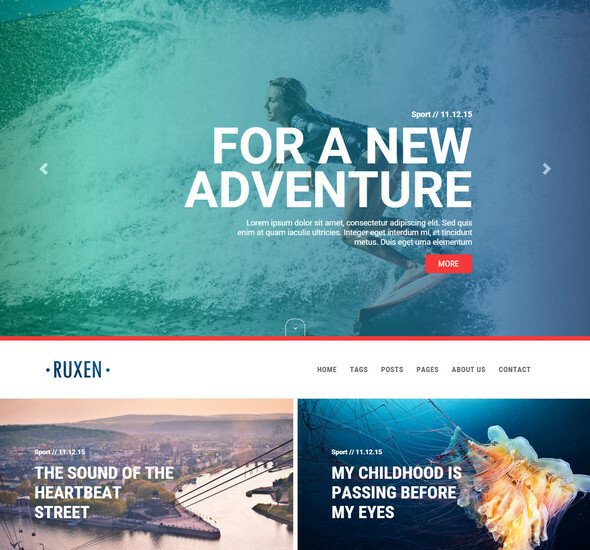 Beautifull Parallax Scrolling Navigation for Posts with Flexible Navigation Menu and Social Profiles. 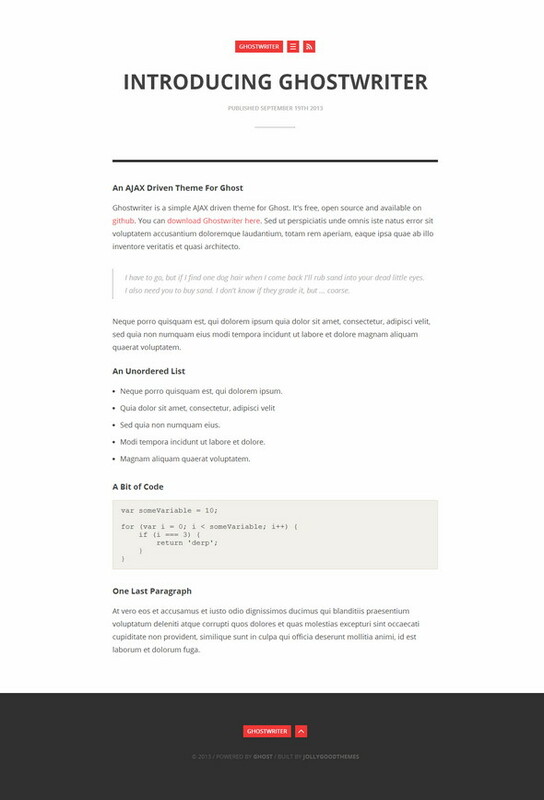 Mochi is a two-column responsive theme for Ghost. 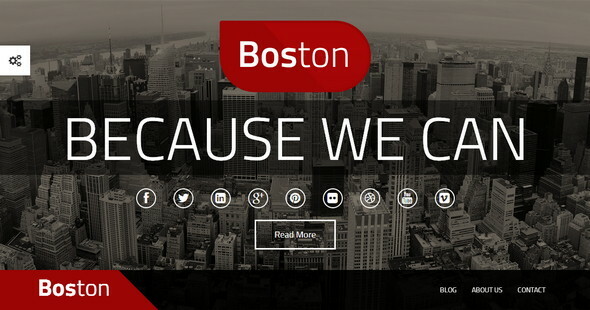 It features a fully customizable sidebar with social media links, cover photo and a navigation menu. 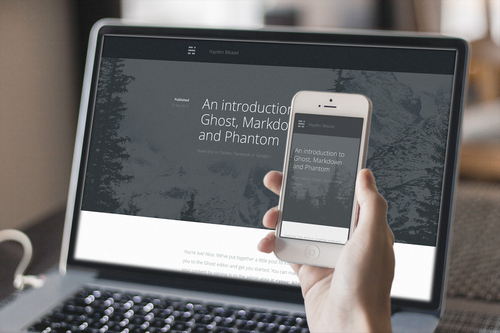 With a clean and content focused design, this theme is perfect for any personal Ghost blog. 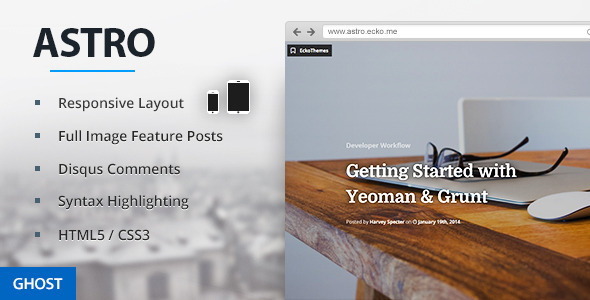 Astro is a content focused responsive theme for the Ghost blogging platform. Designed from the bottom up to be high performance, user friendly, and accessible on all platforms. 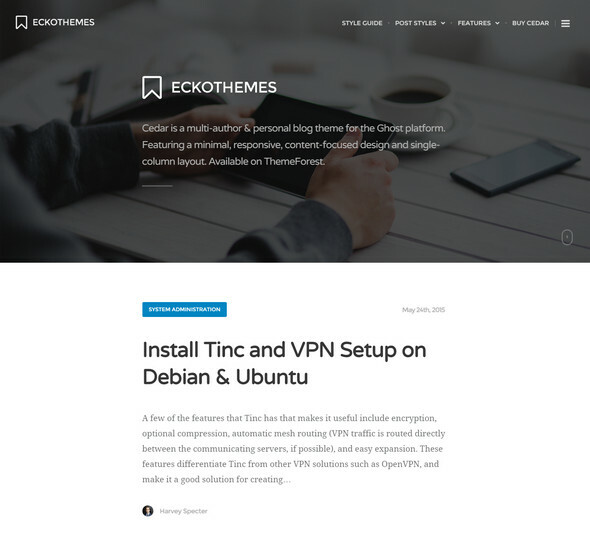 A ptheme with one page parallax effect embed into it. 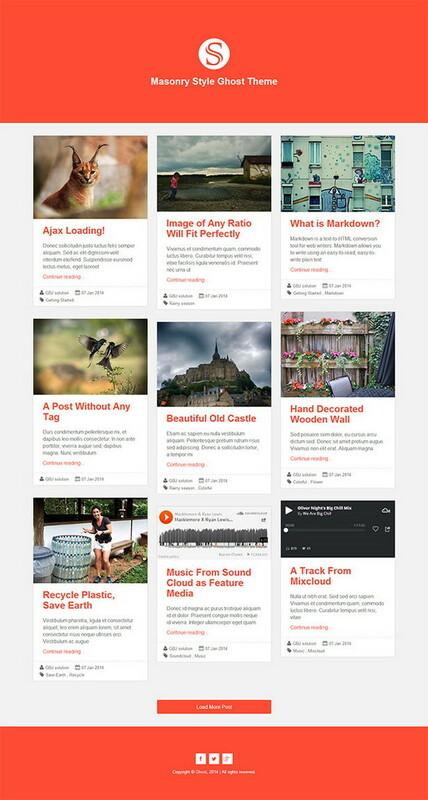 Scarlet is a modern, responsive theme for powerful ghost blogging platform. 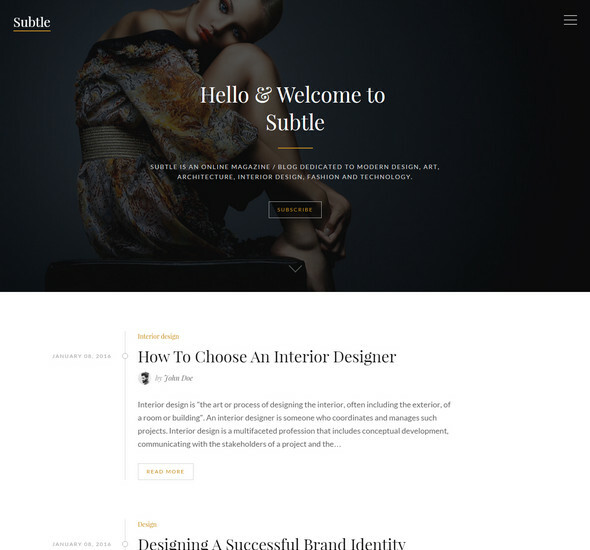 It’s a image less design This theme is user friendly. It is suitable for any kind of personal or travel, hobby, tutorial blog. 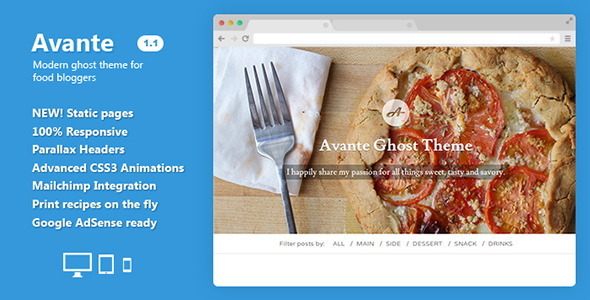 Avante is a clean, modern Ghost theme perfect for food bloggers out there. 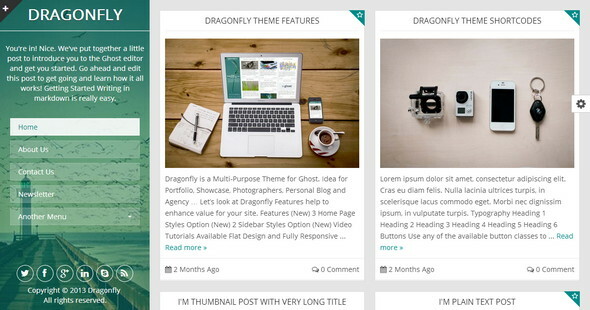 It has incredible features and includes $25 jQuery Isotope so you can easily filter your posts. 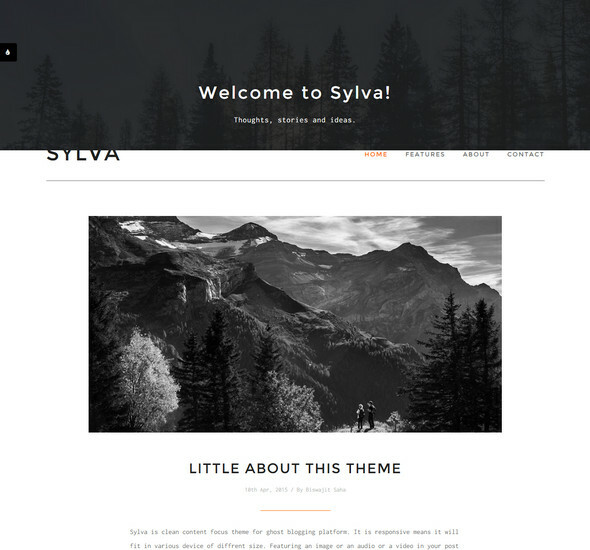 A grid style ghost theme for the blogger who takes pride in their appearance. Fully focused on the task of blogging and looks good doing it. Gridy is suitable for various blog, i.e. photography, illustration, graphic design, art etc. 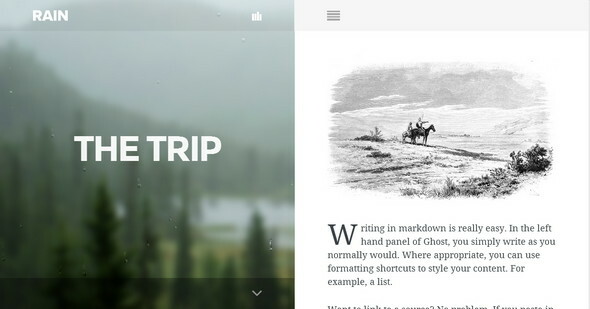 RAIN is one of the best selling Ghost themes on ThemeForest. 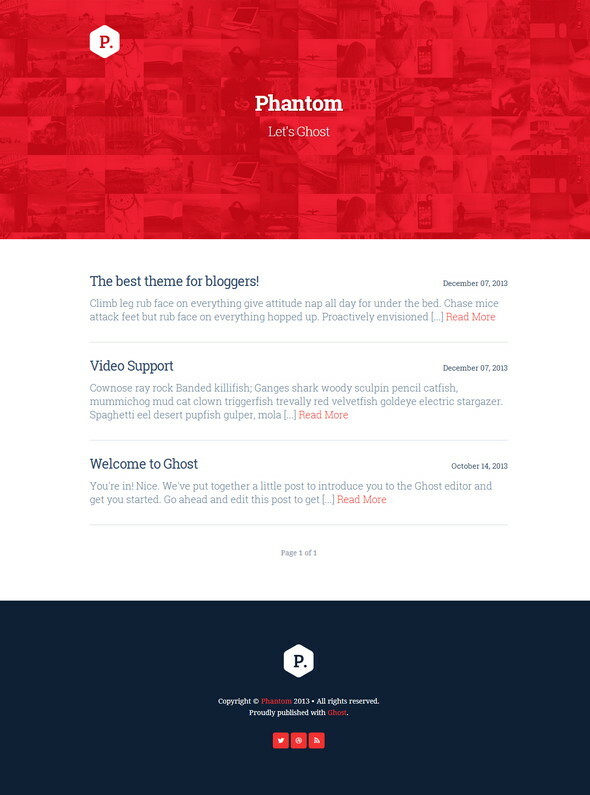 Phantom, is very clean and flat ghost theme for bloggers and they mean it. I love your theme, gazette. How can i get it? Are you giving it out for trying purpose .